Barbuda West Indies 20 ml. E liquid West Indies is available in 20 ml bottle which can hold up to 30ml maximum. E liquid in 50/50 PG/VG and ready to boost. 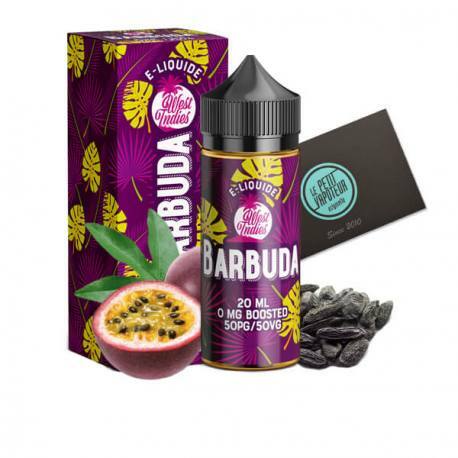 The Barbuda E Liquid 20ml is produced in France by Savourea. The French manufacturers of E Liquid, Savourea proposes their collection: West Indies, e liquids which have exotic savoury flavours by offering recipes of Fruit Cocktails with tropical flavours...Do you want to travel far away? The West Indies E Liquid will transport you to sunny destinations. Each West Indies E Liquid has an paradisiac image which are situated in the Caribbean Islands such as: : Guyana, St-Lucia, Antigua and even Jamaica. So relax and drink a refreshing and fruity cocktail with the West Indies E Liquid. The West Indies 20 ml E Liquid is produced in France by Savourea. The West Indies 20ml can hold up to a maximum of 60ml in E Liquid. For a superior dosage with nicotine boosters we advise you to use the Graduated Twist Bottle or DIY PET Bottle. For an optimum preservation of the flavours, keep your West Indies Juices protected from light, in a dry place, and at room temperature (around 20°C). Shake well before use and do not hesitate to ventilate (open the plug) your West Indies E liquid for a few days before using it for a better restitution of the flavours.